In addition to being named the Crossroads League’s outstanding player this week, Greg Miller was honored nationally as the NAIA Men’s Basketball Player of the Week. Miller, who picked up his third CL Player of the Week honor of the season on Monday, won the NAIA’s weekly award on Tuesday for leading Grace to two victories. Miller helped the Lancers continue their late-season surge with a pair of wins last week, including an upset of No. 11 St. Francis on Saturday. 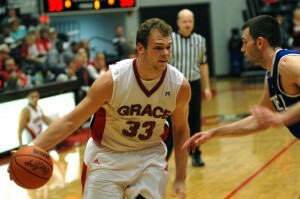 Miller averaged 24.0 points, 12.5 rebounds and 2.5 assists per game to highlight Grace’s efforts. He made a sizzling 58 percent of his shots from the floor, including 67 percent from the 3-point line and 82 percent from the foul line.